Bluegrass. 1751. Being any of several American grasses of the Poa genus and having a bluish cast, earlier called Dutch grass (1671). 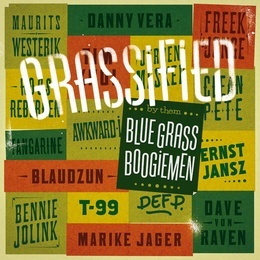 We are the Blue Grass Boogiemen from Holland. We’ve been playing bluegrass (and as the Hillbilly Boogiemen vintage country and rockabilly as well) professionally since 1990. Our line up consists of mandolin, banjo, guitar, upright bass and fiddle and we play and sing using an omni-directional microphone. About our recorded work the leading magazine in the world of bluegrass music “Bluegrass Unlimited” wrote: “The music featured in ‘Whose afraid of the Boogiemen’ is high-energy bluegrass at its finest and establishes this remarkable band as a truly international phenomenon” about our third CD. About our first CD: “This is a highly entertaining band that comfortably handles a range of music with flair, taste and energy. Readers would be well advised to catch this band when they come through town. It should be a great show” and about our second CD: “Gosh, this is what the music world’s been missing, isn’t it?…When I first played this album, which is an immensely entertaining collection, I thought I was listening to some unusually talented country-bluegrass band from Ohio or Michigan or some such place”. But no, we’re not from Ohio or Michigan or some such place, we’re from Holland alright. Holland, Europe that is! However we’re willing to travel to where ever you’d want us to play. So make your event truly international, contact us and book “…one of the most hard-hitting, versatile and entertaining bands on any continent…” as “Bluegrass Europe” magazine put it.